Is the zero lower bound actually a ‘2%-lower bound’? 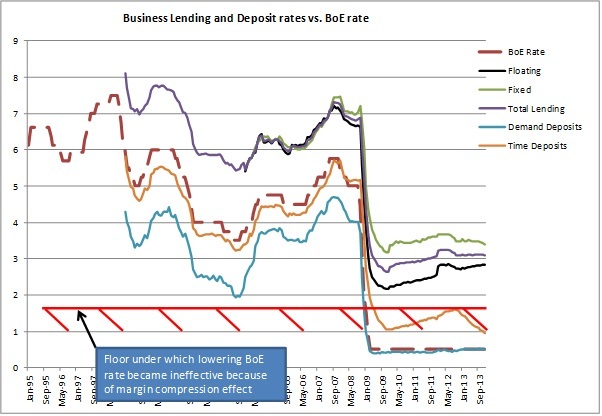 Following my recent reply to Ben Southwood on the relationship between mortgage rates, BoE base rate and banks’ margins and profitability (see here and here), a question came to my mind: if the BoE rate can fall to the zero lower bound but lending rates don’t, should we still speak of a ‘zero lower bound’? It looks to me that, strictly in terms of lending and deposit rates, setting the base rate at 0% or at 2% would have changed almost nothing at all, at least in the UK. From this chart, it is clear that lowering the BoE rate below around 2.5% had no further effect on lowering mortgage rates. As described in my other posts, this is because banks’ net interest income necessarily has to be higher than expenses for them to remain profitable. When the BoE rate falls below a certain threshold that represents operational expenses, banks have to widen the margins on loans as a result. 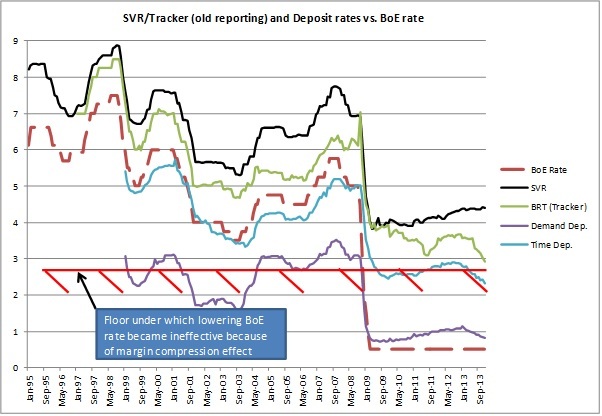 No surprise here, the same margin compression effect appears as a result of the BoE rate collapsing (as well as Libor, as floating corporate lending is often calculated on a Libor + margin basis, unlike mortgages, which are on a BoE + margin basis). 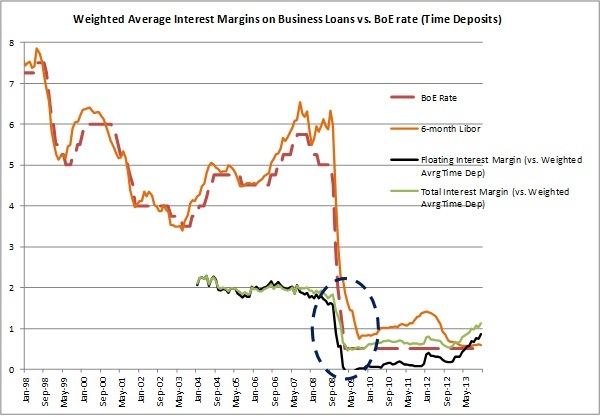 Before that period, changes in the BoE and Libor rates had pretty much no effect on margins. After the fall, banks tried to rebuild their margins by progressively repricing their business loan books upward (i.e. 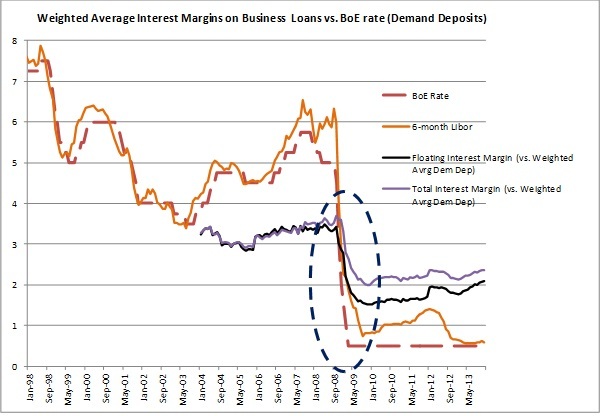 increasing the margins over Libor). Don’t get me wrong though, I am not saying that lowering the BoE rate (and unconventional monetary policies such as QE) is totally ineffective. Lowering rates also positively impact asset prices and market yields, ceteris paribus. This channel could well be more effective than the banking one but it isn’t the purpose of this post to discuss that topic. Nevertheless, from a pure banking channel perspective, one could question whether or not it is worth penalising savers in order to help borrowers that cannot feel the loosening. PS: I am not aware of any academic paper describing this issue, so if you do, please send me the link!